On Monday, Jan. 21, President Barack Obama will be inaugurated for the second time, and an estimated 800,000 people will descend on Washington, D.C., to take in the inaugural ceremony, inaugural parade and swirl of inaugural balls. To commemorate the festivities, we put together this little quiz that features some of the high points -- and low points -- of America's 57 inaugurations. Enjoy! An estimated 1.2 million people came to Washington to see LBJ take the oath of office in 1965. By comparison, President Obama drew an estimated 1.8 million. George W. Bush's $40 million second inauguration was the most expensive in history -- until the next one. Barack Obama's cost $150 million, two-thirds of which was financed by private donations. Following in the footsteps of Jefferson, Carter chose to walk with his family from the Capitol to the White House in the post-inauguration ceremony parade. Until Ronald Reagan came along, Harrison was the oldest man ever elected president. Worried that he didn't seem sufficiently energetic for the job, he tried to demonstrate his vitality by riding on horseback to and from the inauguration, and reciting a 100-minute inaugural speech on a cold and windy day -- all without the benefit of a hat or coat. He caught pneumonia and died 32 days later. In the process, he set four records: He was the oldest president, had the longest inaugural speech, had the shortest administration, and was the first to die in office. Robert Frost became the first inaugural poet when he spoke at John F. Kennedy's swearing-in. Maya Angelou spoke at Bill Clinton's first inaugural and Miller Williams spoke at his second. Ticketmaster is the biggest player in the ticket sales game, but it managed to make a mess of this sale. After announcing that tickets to the inaugural events would go on sale on Monday, January 7, Ticketmaster accidentally opened the sales link a day early. 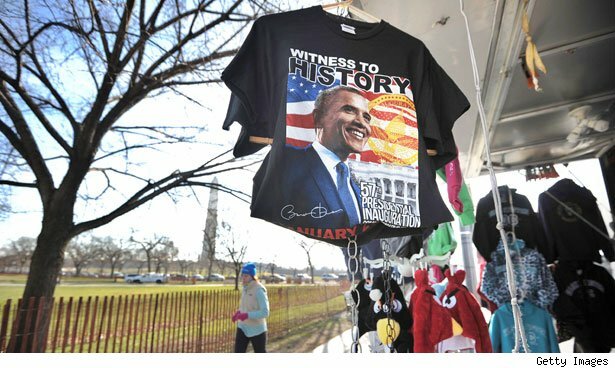 Tickets to the inaugural ball and parade sold out quickly -- leaving a lot of Obama supporters ticketless, and furious. In 1809, famed hostess Dolley Madison hosted the first Inaugural Ball at Long's Hotel. The 400 tickets to the event were sold at a cost of $4 apiece. By comparison, some tickets for this year's inauguration ceremony are being scalped for as much as $12,500 apiece -- and Team Obama is selling inauguration packages for as much as $1 million a pop.